Heart beats for the one he loves. It is equally important to share what you feel and desire. 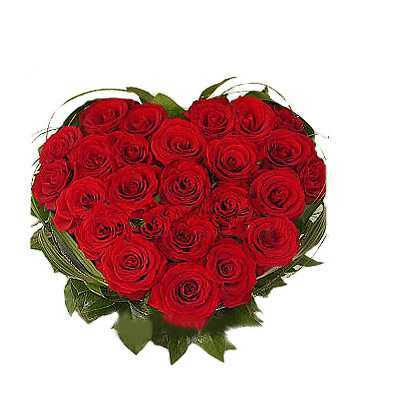 This beautiful bouquet of 30 red roses, assorted in a heart shape is a perfect expression of love. Your loved one will easily understand your feelings and this bouquet will appreciate the effort and true love you hold in your heart. hi. i have placed an order for my anniversary gift. i had written a long message and few others requests. flaberry fullfilled all my wishes, just the way i wanted. made my anniversary so special.. simply loved it.. sitting so far away from my fiance flaberry made it very special for me and my love. my fiance told he had never seen such an amazing bouquet of flowers nor did i see ever. flaberry team i thank you from the bottom of my heart for it so so special.. its simply thebest.. keep it up .. !!! this is just the starting from my side.. hats off to flaberry team..